Karlsruhe is located in the southwest of Germany, in Baden-Württemberg. The city was founded in 1715 by Charles William and is currently the seat of the two highest courts in Germany: the Federal Constitutional Court and the Federal Court of Justice. In addition to this, Germany’s largest oil refinery is found in Karlsruhe and 20% of jobs in the region are in research and development. The Karlsruhe University is the oldest technical university in Germany and home to the Karlsruhe Research Centre, where engineering and scientific research is conducted in the areas of health, earth and environmental science. 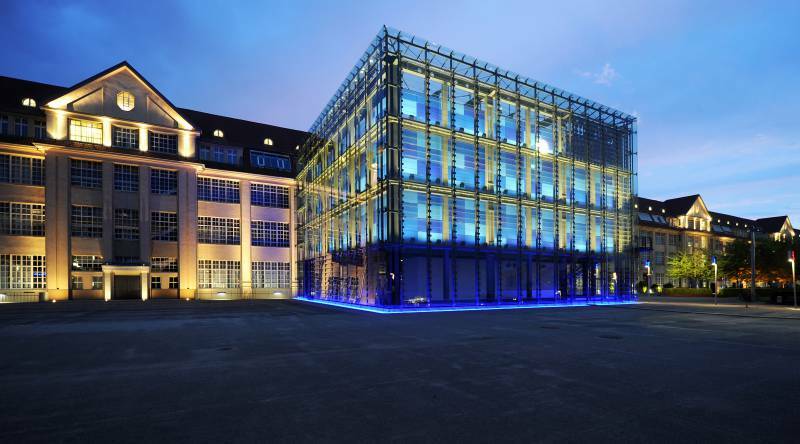 Karlsruhe also hosts one of the European Institute of Innovation and Technology’s Knowledge and Innovation Communities which focus on sustainable energy. Zentrum für Kunst und Medientechnologie (Centre for Art and Media Technology) – The Centre for Art and Media Technology is a unique cultural institution – the only one of its kind in the world! It’s a house filled with traditional art, such as paintings, sculptures and photography, as well as film, media art, music, dance, theatre and performances. The museum was founded in 1989 with the mission to perpetuate classic arts in the digital age. Recent exhibits have included performances by the Little Giant Chinese Chamber Orchestra, a lecture series about evolution and a conference about the hidden beauty carried by light, information, symmetries and structures in Maxwell’s equations (equations describing the physical phenomenon of light). Schloss Karlsruhe (Karlsruhe Palace) – The Karlsruhe Palace was erected in 1715 by Charles III William of Baden-Durlach (yes, the same Charles William who founded the city!) and the city of Karlsruhe has since grown around it. For almost 200 years it served as the residence and seat of government of the margraves, the electoral princes and grand dukes of Baden. It has been home to the Baden State museum since 1921, one of the most active cultural history museums in Germany. The museum contains art and historical living environments from pre- and early history, ancient cultures, the Middle Ages, the baroque period and into the 21st century. Live Escape Games Karlsruhe – Live Escape Games have become a trend around the world, but just in case anyone isn’t familiar with them, we thought we’d include it in this blog! How does it work? Simple! A group of people enter a room, generally 2-6 individuals, and they have a set amount of time, generally 60 minutes, to follow hidden clues in an attempt to find the key to exit the room before the time runs out! There’s strategy and logic involved, as well as a large amount of team work. In Karlsruhe there are currently two different scenarios available: Project Vakium (see iamge below), where a highly unstable element poses a threat to the whole inner city, and Crazy Office Room – an abandoned office by a journalist filled with crazy objects.